For reasons unknown, the earth's inner core has stopped rotating, causing the planet's electromagnetic field to rapidly deteriorate. Instantly, life around the globe begins to change dramatically. In Boston, 32 people with pacemakers, all within a 10-block radius, suddenly drop dead. In San Francisco, the Golden Gate Bridge collapses, sending hundreds of people plunging to their deaths. In London's Trafalgar Square, flocks of pigeons lose their ability to navigate, flying into panicked crowds. And in Rome, as thousands of tourists watch helplessly, an electrical superstorm reduces the ancient Colosseum to rubble. 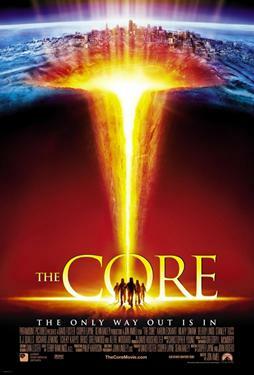 Scrambling to resolve the crisis, government and military officials call upon geophysicist Dr. Josh Keyes and a team of the world's most gifted scientists to travel into the earth's core in a subterranean craft piloted by terranauts Major Rebecca "Beck" Childs and Commander Robert Iverson. Their mission: detonate a nuclear device that will reacativate the core and save the world from sure destruction.